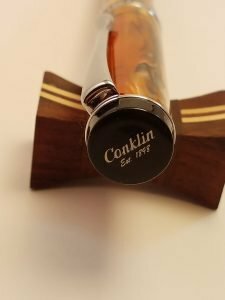 Roy Conklin founded the Conklin Pen Company in 1898 in Toledo, Ohio. The company produced innovative writing tools with iconic filling systems such as the crescent filler. The company gained notoriety with the help of Mark Twain and his vocal support of their pens. In 2009, the Conklin name and brand were purchased by YAFA, which has been in business since 1978. The founder, Yair (Jerry) Greenberg, has been bringing out modern pens with vintage looks. 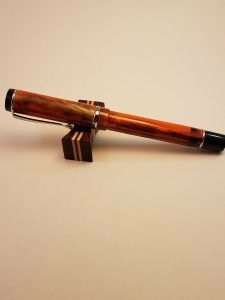 The review today is of the Conklin Duragraph Amber fountain pen. 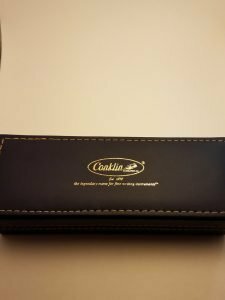 8/10 Packaging: The pen comes in a deep blue faux leather box with yellow stitching around the border with gold embossing in the middle that has the Conklin logo, “Est 1898” and “The legendary name for fine writing instruments”. 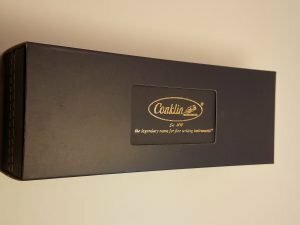 The box has a blue outer sleeve with a window cut in it to see the Conklin logo on the box, and has a sticker on the end and the bottom that gives the model name, color, writing mode, and nib size. 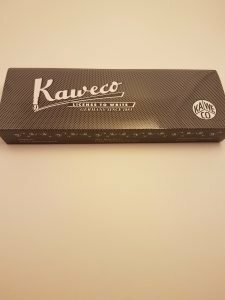 Inside the box are the same embossed logo and motto that are on the lid, as well as a card with information about the pen and refill instructions, two ink cartridges, and a converter. 8/10 Design: The pen has an overall design that is reminiscent of the flattops of the 1930’s and 1940’s. The cap finial has “Conklin Est 1898” engraved on it. The clip is very tight and requires both hands to slip it onto a pocket, but it holds very securely in place. 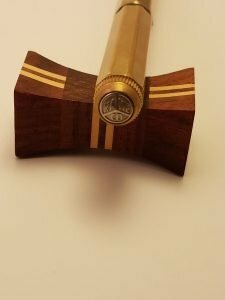 The cap band is steel and has “Conklin” engraved on one side with crescent moons and “Duragraph” engraved on the other side. The threads on the grip section are smooth and unnoticeable when gripping the pen. The smooth black grip section has a slight flair where it meets the nib. The grip section has metal threads to join to the body so it cannot be converted into an eyedropper. 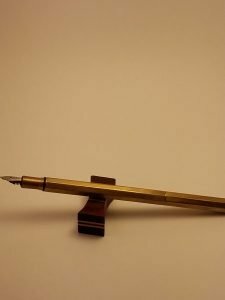 You can post the pen, but it does become back-weighted. 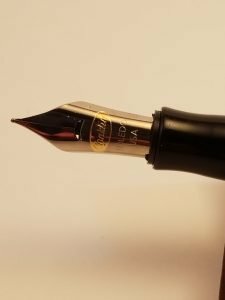 8/10 Nib Performance: The steel nib has a gold Conklin logo engraved, as well as “Toledo USA” and a small “F” showing it is a fine nib. 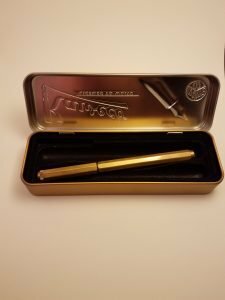 The nib wrote beautifully out of the box with no tinkering needed and gave a pleasant feedback as it wrote. 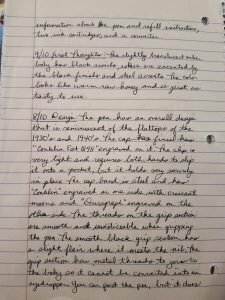 I allowed the pen to sit for nearly two weeks and it wrote with no hesitation or skipping. 9/10 Filling System: The pen included a threaded standard international converter, as well as two cartridges. 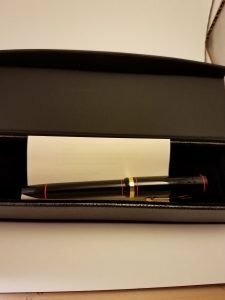 8/10 Value: The pen has a retail price of $65, which I feel is spot on for this model. 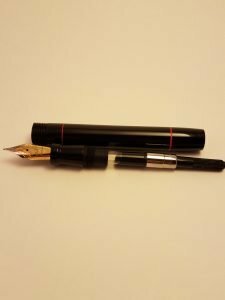 The pen is light, which is perfect for longer writing sessions, but not so light that it feels cheap. 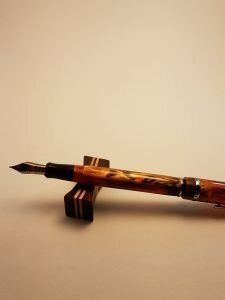 The coloring of the body makes the pen stand out, grabs your attention, and does not let go until you write with it. 50/60 Overall: I was very impressed with this model. 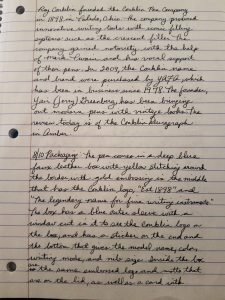 I have been a fan of Conklin for a number of years but this is the first time I was able to use the Conklin Duragraph Amber fountain pen for a prolonged period of time. 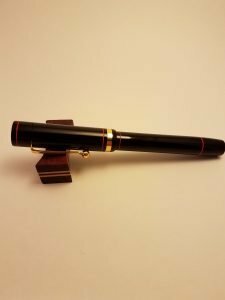 The pen is a true delight to use for short or long writing sessions, and I think it would be a wonderful pen for any level of fountain pen user. Bertram’s Inkwell thanks Eric Aycock and Jessy Aycock for their time and contribution with this wonderful review! 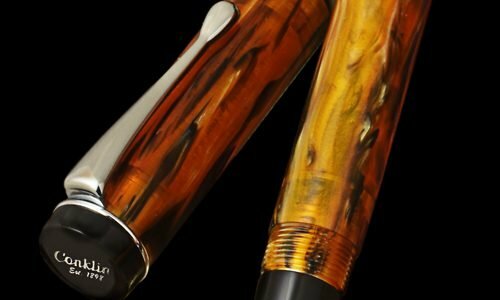 Check out the Conklin Duragraph Amber Fountain Pen here. 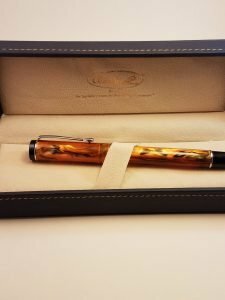 The Bexley Pen Company was founded in 1993 in Columbus, Ohio. 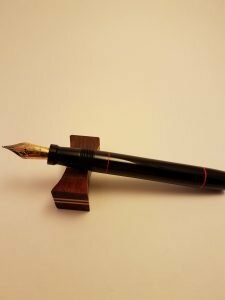 They are known for making modern pens inspired by the “Golden Age of fountain pens.” This review is of the Bexley Demeter fountain pen in black with red accent rings, gold colored cap band, and a medium steel nib. 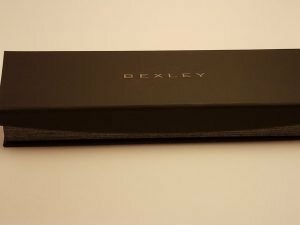 8/10 Packaging: The pen comes inside a black Bexley-branded box with a magnetic flap closure. Also included are filling and cleaning instructions, a warranty slip, and two ink cartridges. A plain black cardboard outer sleeve covers the box. 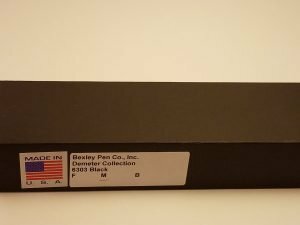 This sleeve also has stickers that read, “Made in U.S.A” and “Bexley Pen Co, Inc. Demeter Collection,” and notes the pen color and nib size. 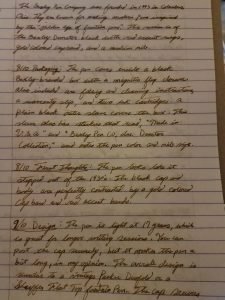 8/10 First thoughts: The pen looks like it stepped out of the 1930’s. The black cap and body are perfectly contrasted by a gold-colored cap band and red accent bands. 9/10 Design: The pen is light at 17 grams, which is great for longer writing sessions. 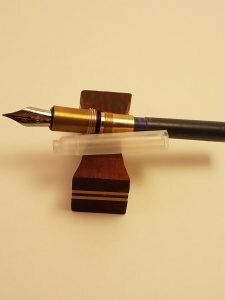 You can post the cap securely, but it makes the pen a bit long, in my opinion. 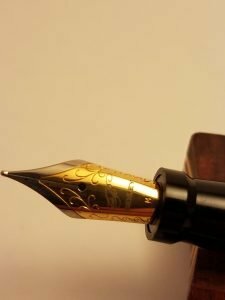 The overall design of the Bexley Demeter fountain pen is similar to a vintage Parker Duofold or Sheaffer Flat Top fountain pen. The cap secures snuggly with one-and-a-half turns, the grip section has a flare at the end and the threads are smooth and barely noticeable. 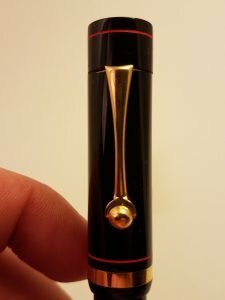 The clip caught my attention as it has a small rollerball on the end that allows you to easily slide the pen in and out of a pocket or pen pouch. The clip ring only goes halfway around the cap, causing a small gap; however, this does not affect the strength of the clip. 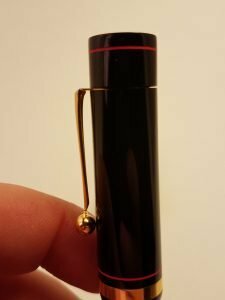 It is possible this is just a flaw on this specific pen as the pictures on Bexley’s website appear to have a clip ring that goes completely around the cap. There is no branding anywhere on the body or cap. It has a shiny black finish with thin red accent bands on the cap and body and a gold-colored cap band that grabs your attention. 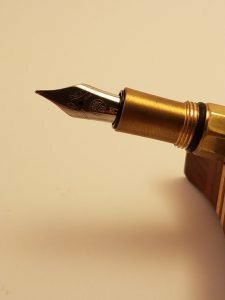 Nib options are all steel and include Fine, Medium, and Broad. 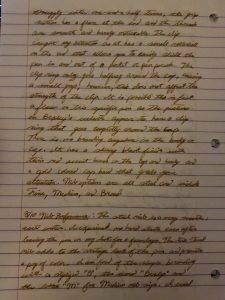 8/10 Nib Performance: The steel nib is a very smooth, wet writer. 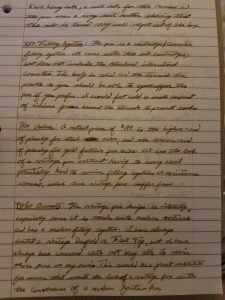 I experienced no hard starts even after leaving the pen on my desk for a few days. The two-tone nib adds to the vintage look of the pen and provides a pop of color. I am fond of the simple branding with a stylized “B,” the word “Bexley,” and the letter “M” for Medium nib size. 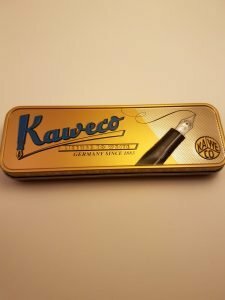 I used KWZ Honey ink, a wet ink, for this review and the pen was a very wet writer showing the nib is tuned very well right out of the box. 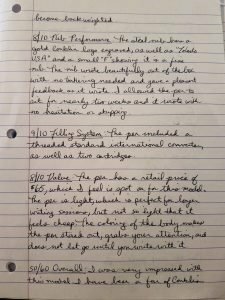 8/10 Filling System: The pen is a cartridge/converter filling system. It comes with two ink cartridges, but does not include the standard international converter. The body is solid and the threads are plastic so you should be able to eyedropper the pen if you prefer. I would just add a small amount of silicone grease around the threads to prevent leaks. 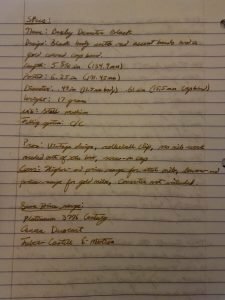 7/10 Value: A retail price of $199 is the higher-end of pricing for steel nib. 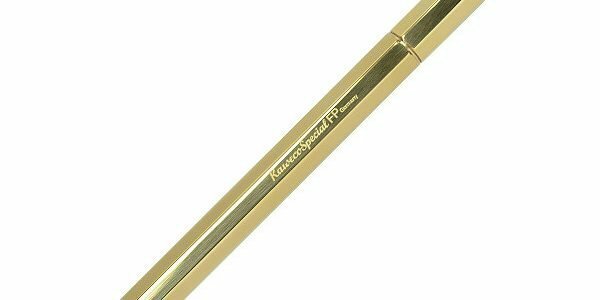 Yet it’s the lower-end of pricing for gold nib fountain pens. 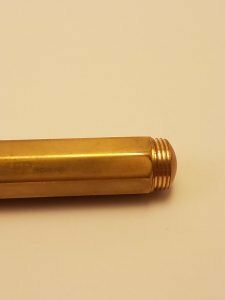 It has the look of a vintage pen without having to worry about potentially hard to service filling systems or maintenance issues, which some vintage pens suffer from. 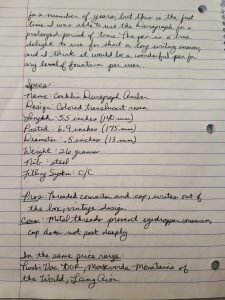 48/60 Overall: The vintage pen design is interesting. Especially since it uses modern materials and has a modern filling system. 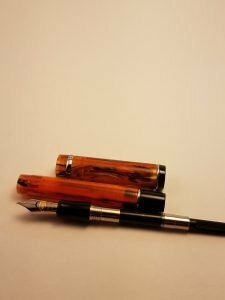 I always wanted a vintage Duofold or Flat Top, but I have always been concerned with not being able to service those pens on my own. 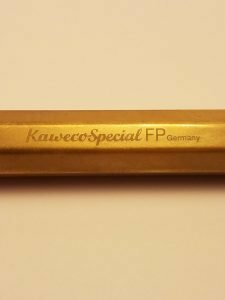 This would be a great substitute for someone that wants the look of a vintage fountain pen with the convenience of a modern fountain pen. 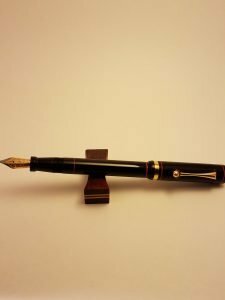 Check out the Bexley Demeter Fountain Pen here.